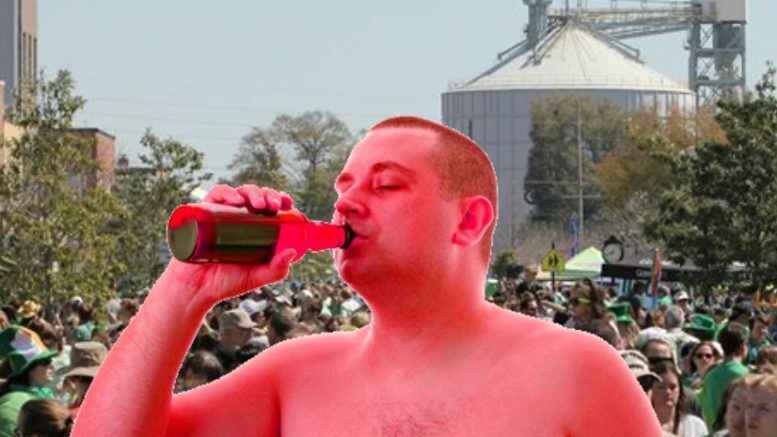 A stumbling, extremely inebriated man at the Park Circle St. Patrick’s Day Festival claimed he was “shust fhhhhyne” earlier today. Mark O’Brien flailed down Montague Avenue, lurching side to side almost bumping into people and slamming into baby strollers. Onlookers were concerned because his lobster-red face was exhibiting signs of extreme sunburn. Mark’s origins are unknown because he appears to have arrived all alone without any friends. Festival attendees were perplexed by how Mark could be so hammered and sunburned by 2pm. As Mark stumbled down the street like a newborn baby deer, the crowd was forced to part around him to protect themselves from his profuse sweatiness. Mark seem confused when asked about his condition. “Hhhhhwere’s mah debit carrrrd,” he said. “Whhho wantz toodoo shahts? Nahbuddy? Whahheva. Dis party is lame anyhhway.” He then stumbled away with a beer that wasn’t his. Mark will wake up with extreme sunburn pain at 3am and notice he’s being spooned by fellow holding cell mate “Fast Ricky”. He’ll be bailed out by his parents for the seventeenth time and go back to getting blackout drunk at bars around the Charleston area.